How Quick is Quick Turn? Quick turn prototype PCB assembly is meant for engineers to get their finished products done in a fast and efficient turnaround time. But just how quickly can you expect to have your parts? 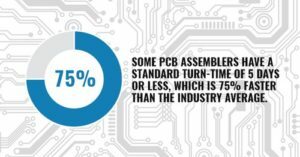 That depends, but as a general rule, the development of machine-assembly for any size orders means that shops can assemble PCBs in simply a fraction of the time it would normally take if it was placed together by hand. In fact, a good chunk of circuit board assembly services has a standard turn-time of five days or less, a good 75% faster than the industry average. Make sure all kits are complete and verified for the project at hand before assembly begins. If there are any missing parts, this discrepancy will be resolved with you and a new method for fabricated. If you are missing parts in your kit, there will be no extra costs to worry about. Your quote for turnaround time will include the day the order is shipped unless you have requested otherwise. All engineering has been approved. The typical five-day turnaround time: Typically, if your order is placed, it will take five business days afterward to procure the parts and to fabricate the bare board. Then when the parts are received, it will take five days afterward for assembly labor, and then the finished PCB will be shipped out on day six. Typical five-day turnaround time when the customer supplies the parts: When the customer supplies the parts, they only have to wait five business days after the order has been placed to receive their finished product! With Advanced Assembly, you can be sure that you will get your prototype PCBs assembled quickly and efficiently. Have any questions? Make sure to contact our professionals today for a quote on your project. Speed is arguably one of the most important factors to consider with evaluating PCB assembly partners. Yet there are many more. Click here to read our guide on “Finding ‘The One’ for You” – a guide to help you in selecting the right partner for your project.